There are a number of treatment options available today for patients with gaps in their teeth. The gaps may be due to accidents or disease leading to teeth loss, and they are sure to ruin your smile and affect you’re self -esteem. One of the most effective procedures we offer at Los Angeles Oral Surgeons is the dental implants Los Angeles treatment. Dental implants have an added advantage to dentures and bridgeworks which is why many patients are opting for them today. They offer a stronger anchorage to the jawbone. Since the dentures are placed and bonded into the jawbone, they provide strong support for the replacement teeth. They are like a strong tooth’s root. 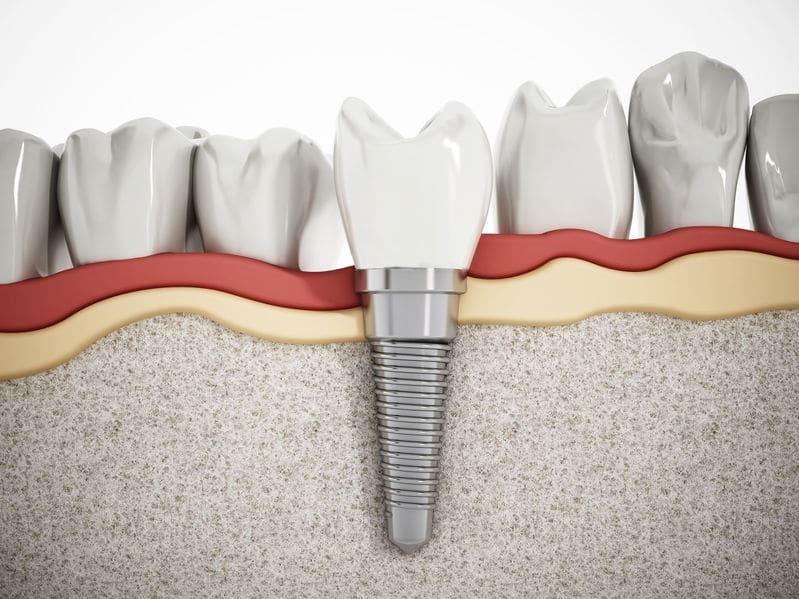 Since the implants can hold the replacement tooth like its own root, the patient feels more natural and comfortable in the mouth. This is unlike dentures which would have to be fixed to the adjacent teeth for support giving the patient odd feelings of stress and instability in the teeth. With the technology that is available today the procedure to replace your teeth with replacement ones using dental implants is achieved in a single session. This means that you do not have to worry about having to stay with gaps in your teeth during the treatment period. You just walk into a dental clinic and leave with your implants and improved smile. The period of time that the procedure depends on the individual case. Patients requiring extraction of the previously damaged tooth then replacement with a new one take a bit longer that immediate dental implant cases. The entire procedure will, however, be achieved in a single session. The oral surgeon will first put the patient under anesthesia. In cases that do not require the patient to be unconscious during treatment, the surgeon will administer local anesthesia keeping them awake but pain-free. After the surgeon has extracted the decayed tooth, they will then insert in titanium implants in the jawbone. Surgery is necessary here to fix the implant into position. The implant will serve the purpose of a strong root for the replacement tooth. A temporary crown is prepared to look like the rest of the teeth and fixed into position to cover the gaping hole. You then leave the clinic with a perfect smile with no gaping undesired spaces. The patient then returns to their dentist on the next scheduled appointment for application of the new permanent crown. The surgeon will have taken a molding of your lost tooth which they will use in the lab in making your new replacement tooth. After the procedure, the oral surgeon will advise you on measures to take during the recovery process. You will get some painkillers to help ease the pain. The mouth and affected area will feel sore for the first few days after the surgery. The patient will have to keep a soft meal diet in order not to irritate the gums which will be weak. However, with time healing will be achieved and the implants will bond with the jawbone creating a firm foundation. You should check in frequently with the dentist to know when the replacement tooth is ready and for its installation.